Two plaques bearing symbols of the Confederacy were removed from the lobby of the state Supreme Court building despite calls from Confederate heritage groups for a public hearing. The plaques were replaced during the weekend with new ones that say equal justice is available to all Texans "regardless of race, creed or color." They note that the building was constructed with money taken from a Confederate pension fund and dedicated to Texans who served in the Confederacy. Confederate heritage groups complained about the "dark of night" removal and promised legal action. The original plaques contained a quotation from Gen. Robert E. Lee and included symbols of the Confederate battle flag and seal of the Confederacy. The Texas chapter of the National Association for the Advancement of Colored People and others called the original plaques offensive to minorities and had asked Gov. George W. Bush, the presumptive Republican presidential nominee, to have them removed. The plaques were replaced Friday night by the state General Services Commission in consultation with the governor's office, Associate Supreme Court Justice Alberto Gonzales said. He said the work was done at night so the noise wouldn't disrupt court business. Bush spokesman Mike Jones issued a statement saying the new plaques demonstrate respect for the state's history and diversity and "will help assure all Texans that our courts provide fair and impartial justice." Supreme Court Chief Justice Tom Phillips said he was glad the plaques were replaced. "I respect the fact that our building was made possible by the use of the Confederate pension fund, but memorializing that with a battle flag and seal of the Confederacy presented a legitimate problem for people who come to our court seeking relief," Phillips said. Just last week, Confederate heritage groups demanded a public hearing before the plaques were removed. The Sons of Confederate Veterans and the Southern Legal Resource Center, which crusades against what it calls Southern heritage violations, said the plaques were removed illegally. The two groups had filed a lawsuit Friday against the General Services Commission. A judge denied their request for a temporary restraining order to block removal of the plaques, said Marshall Davis, spokesman for the Sons of Confederate Veterans. However, the groups said they would press on with the lawsuit challenging removal. 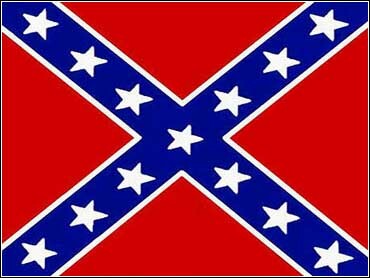 The Confederate battle flag became a presidential campaign issue earlier this year during the primary in South Carolina, where officials were debating the flying of the Confederate flag over the state Capitol in Columbia. Bush declined to offer an opinion on whether the flag should be taken down, saying it was up to the people of South Carolina to decide.